In spring of 2000, a group of enthusiastic Clas Ohlson fans in Norrköping started the Clas Ohlson Fan Club. “At first we were just three old guys but six months later I was interviewed in Radio Dalecarlia and then everything took off. A woman named Helen from Piteå became extremely involved and did a fantastic job with the website. Another 10 guys in Norrköping joined, and we often met and talked about the club. It was a bit silly, but at the same time very playful and warm,” says Per-Inge Kjell, one of the club’s founders. On the website, you could try to win prizes donated by Clas Ohlson suppliers, sign up for a newsletter or share your thoughts on all things Clas Ohlson. The page took off like a rocket. And to balance the prevailing opinion that Clas Ohlson was an “Old Men’s Daycare,” a separate section of the site, called Clara Ohlson, addressed women specifically. At its peak, clasohlsonfan.nu had more than 10,000 members. They referred to themselves as COFs. Several club members were even invited to the annual Insjön Day and to Clas Ohlson’s headquarters. How do you know that a person is a COF? The first sign is probably a desire to find solutions to the various problems that you meet in everyday life. 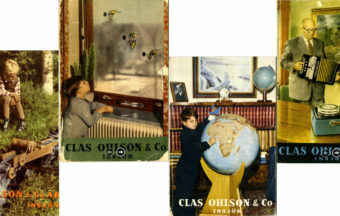 All of Clas Ohlson’s grand-children were featured on the catalogue covers during the 1940s and 1950s. Can you recognize Clas’ relatives?